Have you wondered what profit can you expect in the short term from a Bitcoin ASIC miner should you decide to invest now in one or if you just got the mining hardware? This is usually not an easy task and there are quite a few bitcoin mining calculators out there to help you in the process. 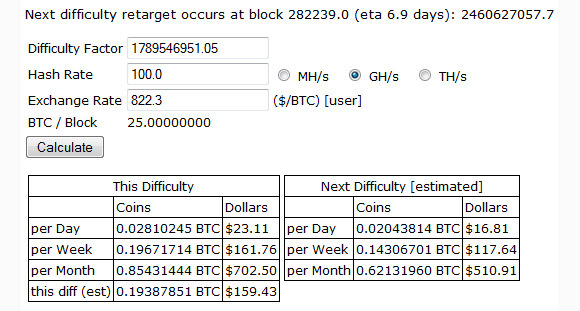 If you need a quick and simple one to give you a quick idea how much you will get from a given hashrate by the end of this difficulty and in the next one, then you might want to check out this tool. In the example above we are calculating the profit we can expect from a 100 GH/s Bitcoin ASIC miner and you can see the results above. You can experiment and try with different values, what you should have in mind that the average difficulty increase is currently about 30% per cycle. Also note that the calculator takes into account the current Bitcoin exchange value and also does not calculator any costs fr electricity, this is something that you need to consider yourself based on the power consumption of your mining hardware as well as on the price of electricity per kW/h.